When I was young, I lived with my grandparents for 3 or 4 months every summer. While I was there, my grandpa taught me all sorts of things about self-reliance, homesteading, and living a simple life. I didn’t know it at the time, but all those basic survival skills would come in handy throughout my life. Today I want to share some of them with you. One of the most entertaining activities back when I was a kid was foraging… As we walked around my grandpa’s property, he would point out wild edibles and things that might be useful around the homestead. The thing I looked forward to the most was hunting for wild mushrooms. I know a lot of people say we should stay away from them because they could be poisonous, but I’ve never heard of anyone being intoxicated in my tow. And we would do this several times every year! Of course, you have to know exactly which mushrooms to pick up. If you don’t, it’s probably best to start foraging something else like berries, nuts, dandelion greens, wild spinach, clovers, mulva and many more. I should point out that many of these wild edibles grow in cities (in parks and other green spaces). As long as you know how to look for them, you’ll have yet another food source at your disposal when everyone else will kill for a loaf of bread. Of course, just like mushrooms, some of these plants are also poisonous so please stay away from the ones that have thorns, beans, or seeds inside pods. As long as you’re not planning raising them in large numbers, farm animals are easy. My grandpa had a Holstein cow for milk, a couple pigs, and several chickens. Chickens are by far the easiest ones to take care of because all they need to survive is grass, corn and water. Ducks, geese, and turkeys are also small and easy to grow. And let’s not forget guinea fowls (of which my aunt was fond of). If you’re up for the challenge, pigs are a great choice too because they don’t mind sitting inside a small, dark place all day long and will provide you with plenty of food for the winter. The only problem is, they’re smelly and that might tip off other people that you have food (not to mention the noise). But then again, noise and poop are problems you’ll encounter with all of these farm animals. My grandpa loved his garden. Whenever he wanted to get away, he would just stand out there alone and smoke his pipe. He planted vegetables throughout the year, so when I was there I got to help plant beans, corn, cucumbers, eggplant, peppers, and squash. All of these require you to know how to use a hoe and a rake. I can’t say I enjoyed planting things because I’d spend most of the time bent over, but not everything about homesteading is fun. Of course, even more important than knowing how to use these tools is knowing when to plant them, where to plant them, how to rotate them, the distance between the seeds, and so on. My grandpa had all this information in his head–no need for Google! This was one of the things I really looked forward to every summer, particularly since we had lots of land. No electricity meant no lawn mowers for us so we had to use something a little more rudimentary: a scythe. The trick is to cut a small strip of grass with each move and to avoid pressing the scythe into the ground as you move or you’ll end up putting a lot more effort into this. The most important thing to keep in mind is to watch out for the blade, particularly when you’re sharpening it. I once allowed my grandpa’s scythe to fall over and hit my index finger. Needless to say, I lost some blood and it hurt like hell. 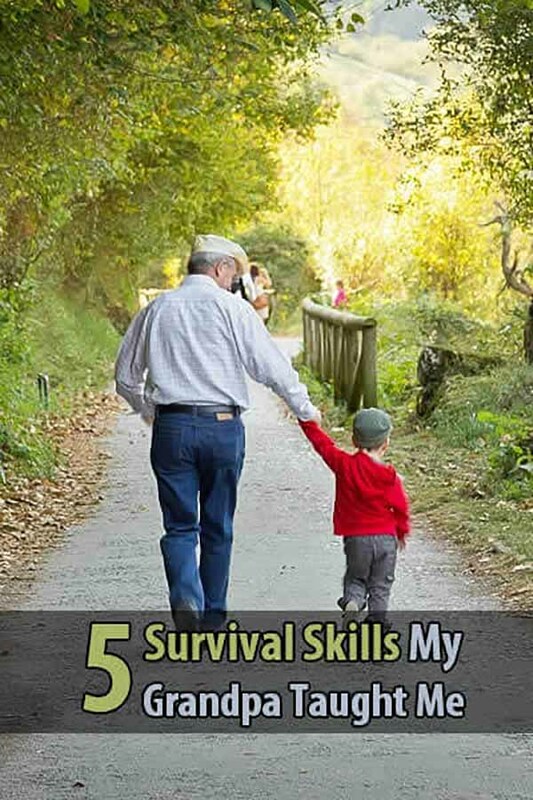 Of course, these are just a few of many survival skills my grandpa taught me. There was a lot to learn and sometimes it was tough work, but doing chores around the homestead was a great way to get in some quality time with my grandpa that I still cherish to this day. What did your grandpa teach you? Leave a comment below. « Would You Survive A Home Invasion?